A top secret physics conference. A remote back country campsite. The novel started with a visit to Bryce Canyon National Park in May 2012. My husband and I stayed at the Lodge and hiked some of the trails. The more I looked around the more I thought this would be a great place for a mystery. With reading all those theoretical physics books, I knew I wanted some physicists to figure in, and I didn’t want an outright murder since I don’t write murder mysteries, so someone had to disappear. That’s how I start a book, with a few loose ideas. At BCNP I talked to one of the park rangers, Jan Stock, who was Fee Manager and Volunteer Coordinator. Explaining that I wrote mysteries, I asked her if there were any unusual things that happened in the park. She thought about it and said not much beyond the odd camera theft. Then she thought some more and said that there was something odd. About six times a year people send back rocks they stole from the park, because they started having all kinds of bad luck in their lives and thought the rocks were the cause. They even tell where they stole the rocks from so the rangers can put them back to appease the hoodoo gods. True story, I kid you not. So you never know. Not everything is as it seems. Maybe it was Mur Ray. What I try to key off in this novel and in my sci fi novels is Arthur C. Clarke's statement "Any sufficiently advanced technology is indistinguishable from magic." I spend quite a bit of time reading theoretical physics books. Dr. Lisa Randall, who's the inspiration for Eloise Bright, has a book Warped Passages -- Unraveling the Mysteries of the Universe's Hidden Dimensions that lays out the math for other dimensions. Whether they exist or not has not been proven experientially. They are only theories. Neil de Grasse-Tyson is the inspiration for Robert Blank. I watch his shows on NOVA and the Cosmos series and have read one or two of his books. While I know no theoretical physicists personally, I've watched them on World Science U and YouTube panels and symposiums. While scientists in general would be a hard group to convince about aliens, I think a physicist, given the right math equations could be swayed or at least nudged, especially out in the middle of nowhere where not everything is as it seems. One could start asking, what is real here? That's what I'm exploring in this book. There's also the Search for Extraterrestrial Intelligence Institute (SETI) that I mention in the book, which "seeks evidence of life in the universe by looking for some signature of its technology." The Director for SETI Research, Dr. Jill Tarter, is a woman who is another of the inspirations for Eloise Bright. I bet if she were in Eloise Bright's shoes, she'd be mighty interested in Murray and his equations. Another interesting book is Our Mathematical Universe -- My Quest for the Ultimate Reality of Nature. The author, Dr. Max Tegmark, basically says we are all a math equation, among a lot of other interesting stuff. Math equations are Eloise's and Murray's common ground and means of communication. Not many scientists are going to read this book. 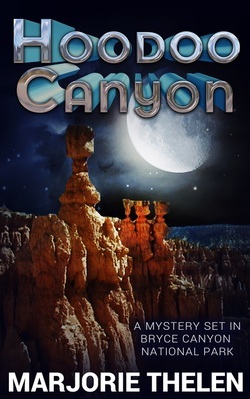 I'm in the mystery, adventure, fantasy market with Hoodoo Canyon -- the fast read, immediate gratification group. I think there will be readers who don't buy that a physicist would be easily taken with the alien thing, but there'll be some that buy right in because they want to believe that such a scenario is possible.